Making use of ‘opt out’ permissions on relevant student events in May, we were able to email with permission, inviting students to enter the Hostelworld competition. We created the Hostelworld Union Challenge, where Students’ Unions could compete to gain the most student entries for a chance to win an awesome prize. Sixteen Unions battled it out to win a selection of cracking prizes including a 30ft inflatable cinema screen with projection system. 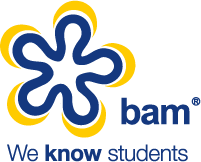 The Unions used their full range of media, from student email sends to display, online, and social channels, with BAM supplying artwork for all their needs. Each Union had a designated landing page, and a BAM-built platform to track entries from each Union. Delivering fun and brand recognition for Hostelworld was as important to us as email data. As such, our promo teams visited a selection of university campuses, summer balls and graduation events armed with green screens, inflatables and silly props for students to take Hostelworld-branded photos of themselves in exotic locations. Students simply had to enter the competition to join in the fun! Photos were then posted on Twitter and shared widely on social media by the students themselves. We pushed emails through our collection of official student email databases, which exceeds 500,000 addresses. In addition to excellent statistical results, there was great feedback and interaction with students both at live events and on social media throughout the campaign.